Some months ago I began an explanation about wheat-free baking. 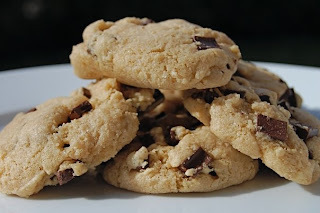 I continue this discussion in my current T/S post, including baking tips, the recipe for my "Gluten-Be-Gone" Homestyle Chocolate Chip Cookies, and also links to some of my other wheat-free and gluten-free recipes. Also, if you haven't voted in the VegNews Awards survey yet... and, if you'd like to cast your votes for me in the categories of Favorite Blog and Favorite Cookbook Author, you can link through below... thanks! Good luck in the VegNews Awards! ED&BV is my go-to cookbook for cookies of any kind. I am so thankful for your recipes! Without them, I don't know how I would have discovered how delicious spelt flour is in cookies (especially your Homestyle Chocolate Chip Cookies)! I'm trying to learn more about gluten-free baking- thanks for all your help and wisdom!